AUTOBIOGRAPHY, THE EARLY YEARS • *Born in Akron, OH (1943) • *Moved to Kansas City At 3. • *Infected with science By : . His Mother, Mrs. Esther Virginia Rhoads . 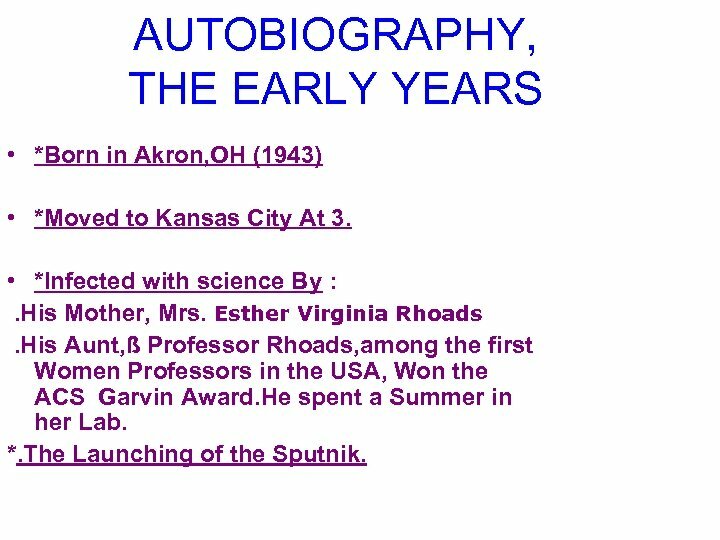 His Aunt, ß Professor Rhoads, among the first Women Professors in the USA, Won the ACS Garvin Award. He spent a Summer in her Lab. *. The Launching of the Sputnik. 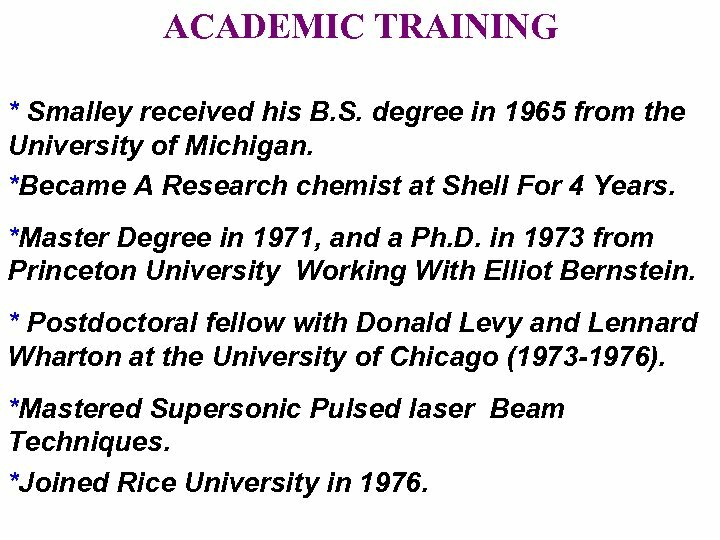 ACADEMIC TRAINING * Smalley received his B. S. degree in 1965 from the University of Michigan. *Became A Research chemist at Shell For 4 Years. *Master Degree in 1971, and a Ph. D. in 1973 from Princeton University Working With Elliot Bernstein. * Postdoctoral fellow with Donald Levy and Lennard Wharton at the University of Chicago (1973 -1976). *Mastered Supersonic Pulsed laser Beam Techniques. *Joined Rice University in 1976. 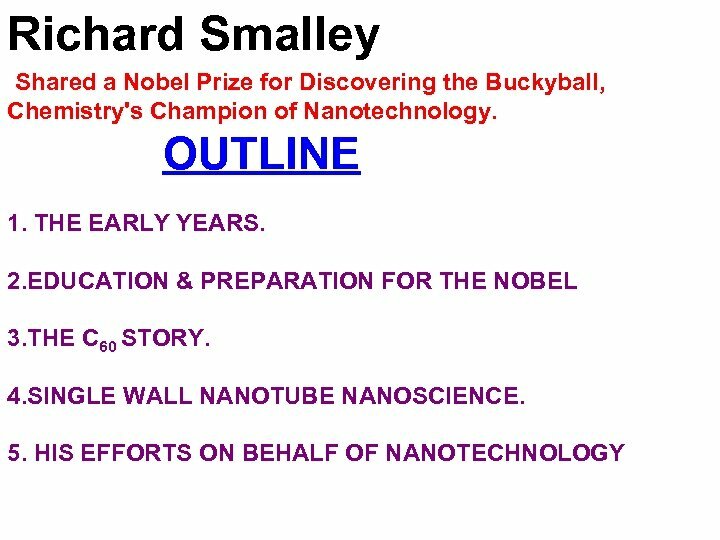 THE 1996 NOBEL PRIZE IN CHEMISTRY • SMALLEY, KROTO&CURL SPENT 5 YEARS TRYING TO CONVINCE THE WORLD OF THE BUCKY (SOCCER) BALL STRUCTURE. 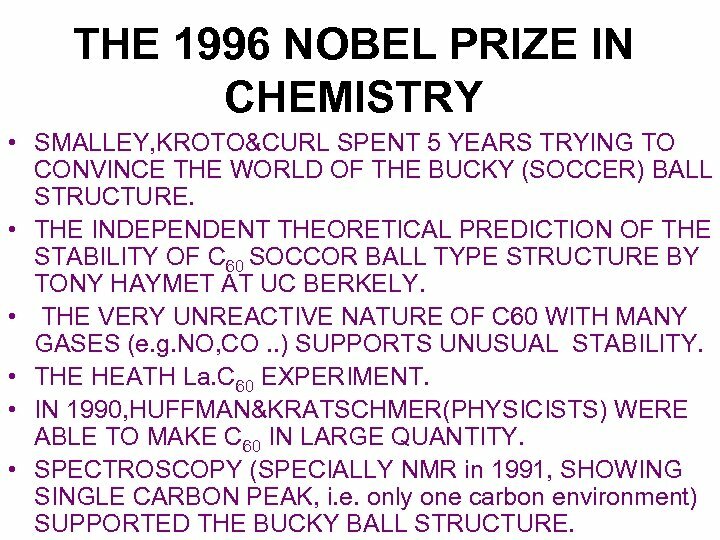 • THE INDEPENDENT THEORETICAL PREDICTION OF THE STABILITY OF C 60 SOCCOR BALL TYPE STRUCTURE BY TONY HAYMET AT UC BERKELY. 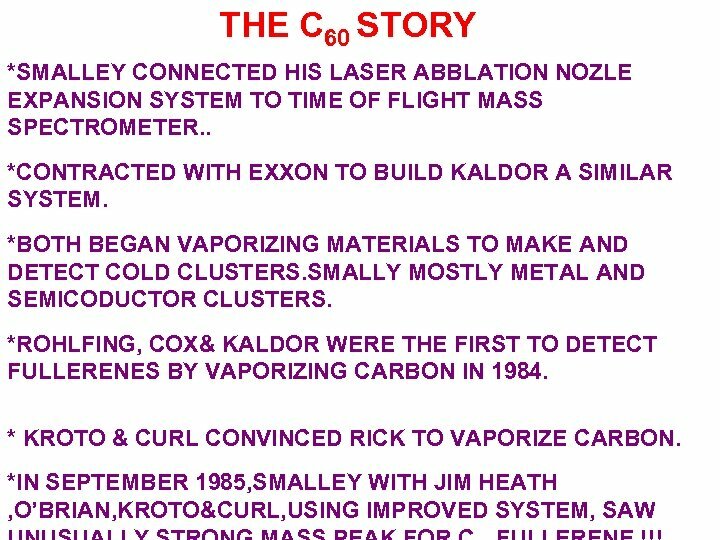 • THE VERY UNREACTIVE NATURE OF C 60 WITH MANY GASES (e. g. NO, CO. . ) SUPPORTS UNUSUAL STABILITY. • THE HEATH La. C 60 EXPERIMENT. 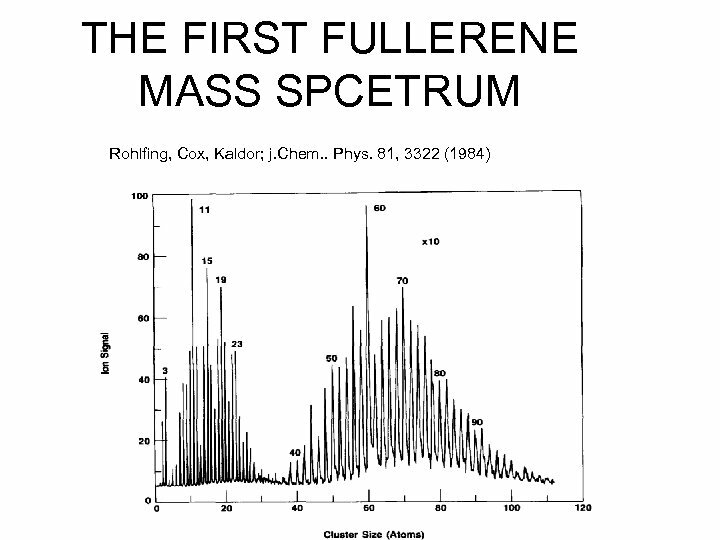 • IN 1990, HUFFMAN&KRATSCHMER(PHYSICISTS) WERE ABLE TO MAKE C 60 IN LARGE QUANTITY. 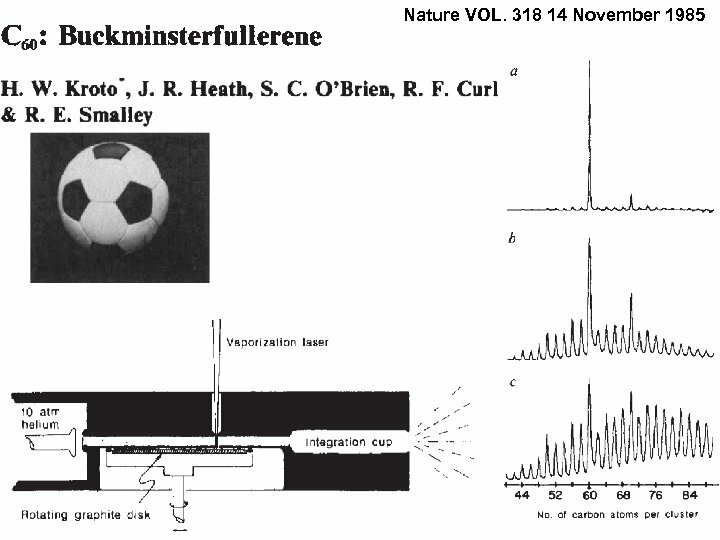 • SPECTROSCOPY (SPECIALLY NMR in 1991, SHOWING SINGLE CARBON PEAK, i. e. only one carbon environment) SUPPORTED THE BUCKY BALL STRUCTURE. 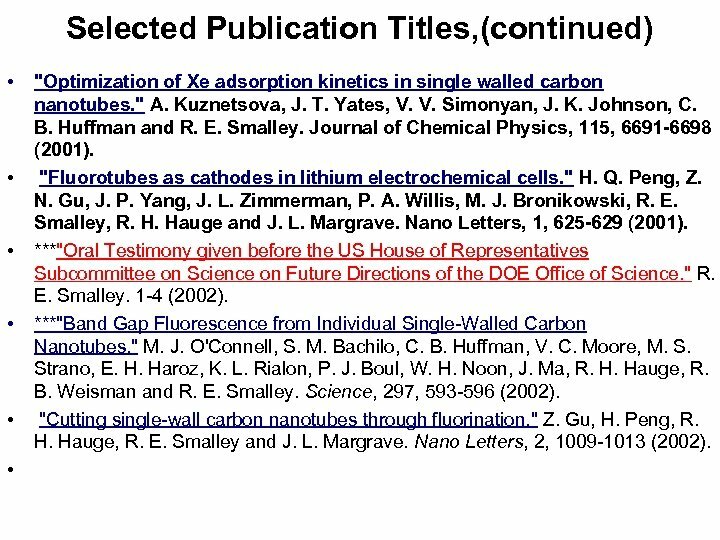 Selected Publication Titles, (continued) • • • "Optimization of Xe adsorption kinetics in single walled carbon nanotubes. " A. Kuznetsova, J. T. Yates, V. V. Simonyan, J. K. Johnson, C. B. Huffman and R. E. Smalley. Journal of Chemical Physics, 115, 6691 -6698 (2001). "Fluorotubes as cathodes in lithium electrochemical cells. " H. Q. Peng, Z. N. Gu, J. P. Yang, J. L. Zimmerman, P. A. Willis, M. J. Bronikowski, R. E. Smalley, R. H. Hauge and J. L. Margrave. Nano Letters, 1, 625 -629 (2001). ***"Oral Testimony given before the US House of Representatives Subcommittee on Science on Future Directions of the DOE Office of Science. " 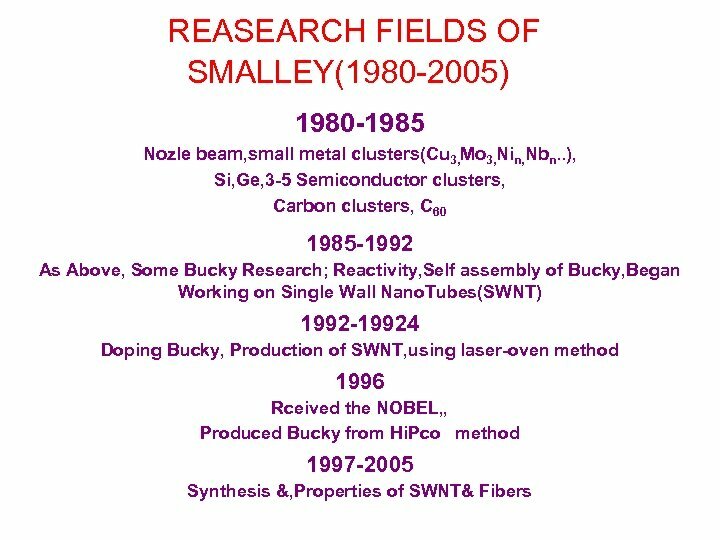 R. E. Smalley. 1 -4 (2002). ***"Band Gap Fluorescence from Individual Single-Walled Carbon Nanotubes. " M. J. O'Connell, S. M. Bachilo, C. B. Huffman, V. C. Moore, M. S. Strano, E. H. Haroz, K. L. Rialon, P. J. Boul, W. H. Noon, J. Ma, R. H. Hauge, R. B. Weisman and R. E. Smalley. Science, 297, 593 -596 (2002). "Cutting single-wall carbon nanotubes through fluorination. " Z. Gu, H. Peng, R. H. Hauge, R. E. Smalley and J. L. Margrave. Nano Letters, 2, 1009 -1013 (2002). 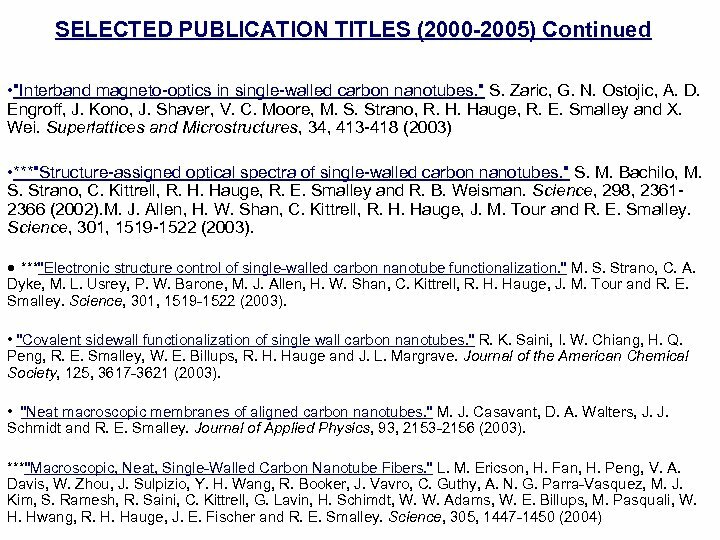 SELECTED PUBLICATION TITLES (2000 -2005) (Continued) ***"Structure-dependent hydrostatic deformation potentials of individual single-walled carbon nanotubes. " J. Wu, W. Walukiewicz, W. Shan, E. Bourret-Courchesne, J. W. Ager, K. M. Yu, E. E. Haller, K. Kissell, S. M. Bachilo, R. B. Weisman and R. E. Smalley. 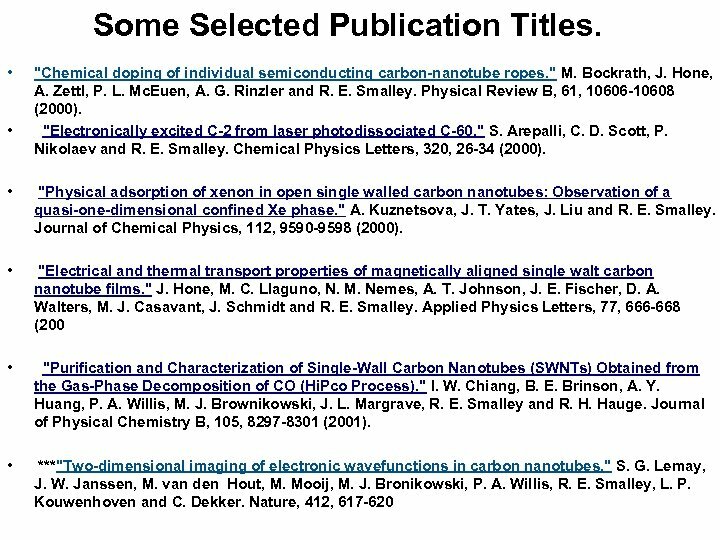 Physical Review Letters, 93, 017404, (2004). ***"Ultrafast carrier dynamics in single-walled carbon nanotubes probed by femtosecond spectroscopy. " Y. Z. Ma, J. Stenger, J. Zimmermann, S. M. Bachilo, R. E. Smalley, R. B. Weisman and G. R. Fleming. Journal of Chemical Physics, 120, 3368 -3373 (2004). 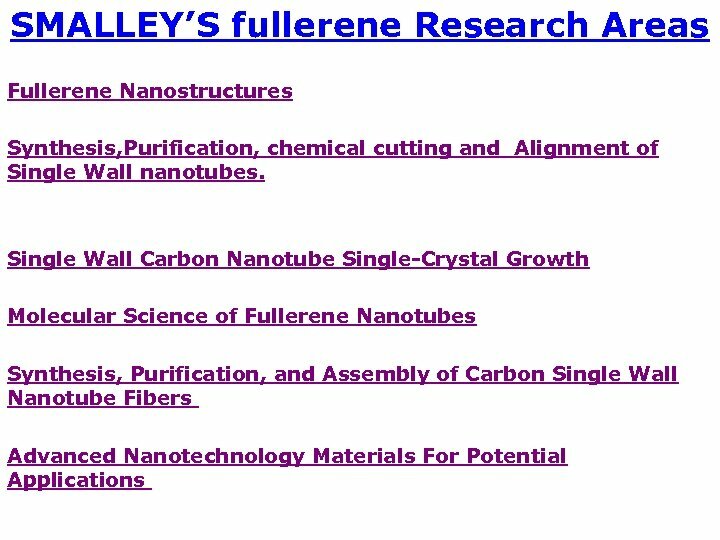 ***"Macroscopic, Neat, Single-Walled Carbon Nanotube Fibers. " L. M. Ericson, H. Fan, H. Peng, V. A. Davis, W. Zhou, J. Sulpizio, Y. H. Wang, R. Booker, J. Vavro, C. Guthy, A. N. G. Parra-Vasquez, M. J. Kim, S. Ramesh, R. Saini, C. Kittrell, G. Lavin, H. Schimdt, W. W. Adams, W. E. Billups, M. Pasquali, W. H. Hwang, R. H. Hauge, J. E. Fischer and R. E. Smalley. Science, 305, 1447 -1450 (2004). "Estimation of magnetic susceptibility anisotropy of carbon nanotubes using magnetophotoluminescence. " S. Zaric, G. N. Ostojic, J. Kono, J. Shaver, V. C. Moore, R. H. Hauge, R. E. Smalley and W. Xing. 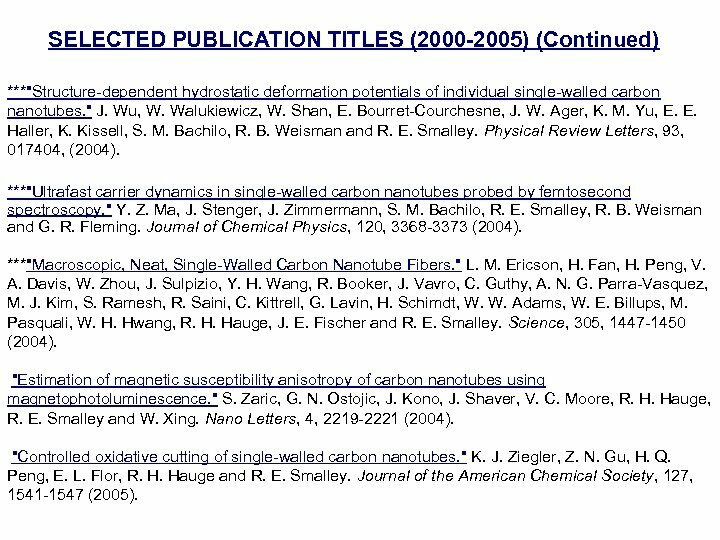 Nano Letters, 4, 2219 -2221 (2004). "Controlled oxidative cutting of single-walled carbon nanotubes. " K. J. Ziegler, Z. N. Gu, H. Q. Peng, E. L. Flor, R. H. Hauge and R. E. Smalley. Journal of the American Chemical Society, 127, 1541 -1547 (2005). 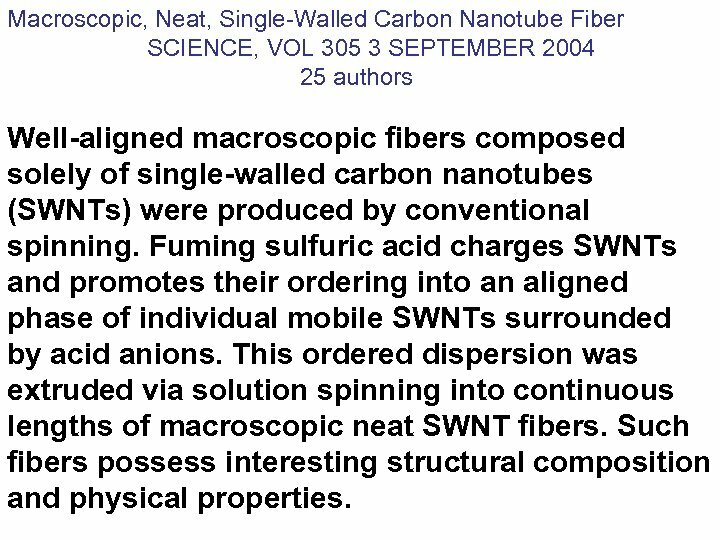 Macroscopic, Neat, Single-Walled Carbon Nanotube Fiber SCIENCE, VOL 305 3 SEPTEMBER 2004 25 authors Well-aligned macroscopic fibers composed solely of single-walled carbon nanotubes (SWNTs) were produced by conventional spinning. Fuming sulfuric acid charges SWNTs and promotes their ordering into an aligned phase of individual mobile SWNTs surrounded by acid anions. This ordered dispersion was extruded via solution spinning into continuous lengths of macroscopic neat SWNT fibers. Such fibers possess interesting structural composition and physical properties. 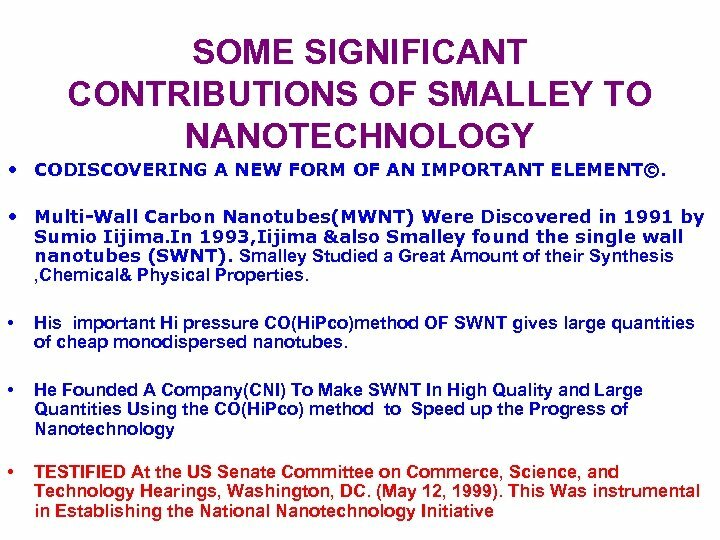 CNI SMALLEY’S COMPANY MAKING NANOTUBES • Which Products Can Carbon Nanotubes Be Used In? 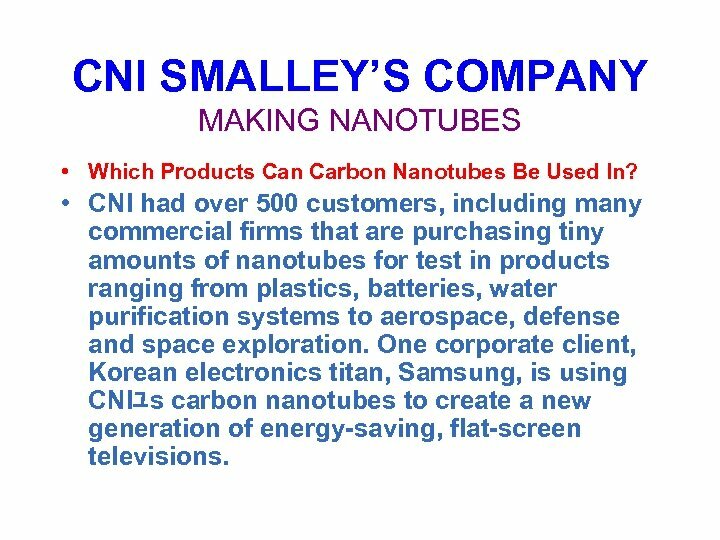 • CNI had over 500 customers, including many commercial firms that are purchasing tiny amounts of nanotubes for test in products ranging from plastics, batteries, water purification systems to aerospace, defense and space exploration. One corporate client, Korean electronics titan, Samsung, is using CNIﾕs carbon nanotubes to create a new generation of energy-saving, flat-screen televisions. 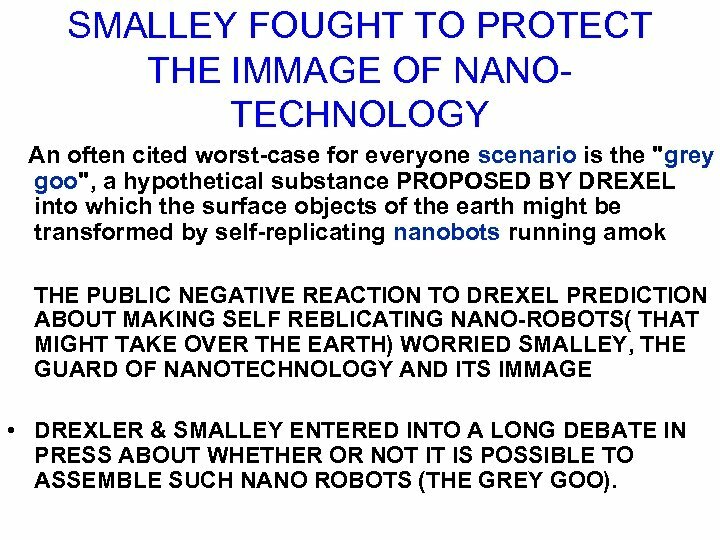 SMALLEY FOUGHT TO PROTECT THE IMMAGE OF NANOTECHNOLOGY An often cited worst-case for everyone scenario is the "grey goo", a hypothetical substance PROPOSED BY DREXEL into which the surface objects of the earth might be transformed by self-replicating nanobots running amok THE PUBLIC NEGATIVE REACTION TO DREXEL PREDICTION ABOUT MAKING SELF REBLICATING NANO-ROBOTS( THAT MIGHT TAKE OVER THE EARTH) WORRIED SMALLEY, THE GUARD OF NANOTECHNOLOGY AND ITS IMMAGE • DREXLER & SMALLEY ENTERED INTO A LONG DEBATE IN PRESS ABOUT WHETHER OR NOT IT IS POSSIBLE TO ASSEMBLE SUCH NANO ROBOTS (THE GREY GOO). 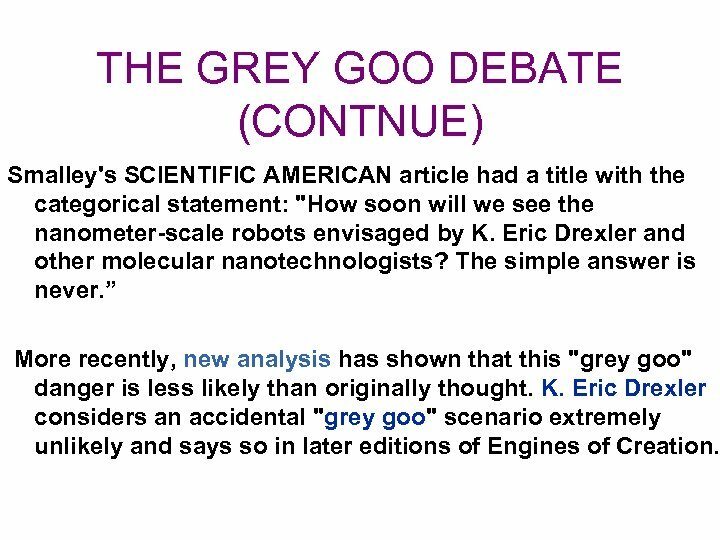 THE GREY GOO DEBATE (CONTNUE) Smalley's SCIENTIFIC AMERICAN article had a title with the categorical statement: "How soon will we see the nanometer-scale robots envisaged by K. Eric Drexler and other molecular nanotechnologists? The simple answer is never. ” More recently, new analysis has shown that this "grey goo" danger is less likely than originally thought. K. Eric Drexler considers an accidental "grey goo" scenario extremely unlikely and says so in later editions of Engines of Creation. 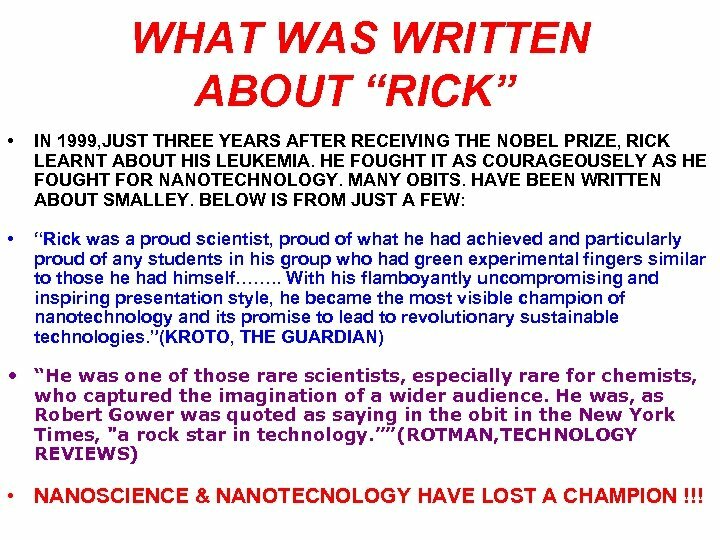 WHAT WAS WRITTEN ABOUT “RICK” • IN 1999, JUST THREE YEARS AFTER RECEIVING THE NOBEL PRIZE, RICK LEARNT ABOUT HIS LEUKEMIA. HE FOUGHT IT AS COURAGEOUSELY AS HE FOUGHT FOR NANOTECHNOLOGY. MANY OBITS. HAVE BEEN WRITTEN ABOUT SMALLEY. BELOW IS FROM JUST A FEW: • “Rick was a proud scientist, proud of what he had achieved and particularly proud of any students in his group who had green experimental fingers similar to those he had himself……. . With his flamboyantly uncompromising and inspiring presentation style, he became the most visible champion of nanotechnology and its promise to lead to revolutionary sustainable technologies. ”(KROTO, THE GUARDIAN) • “He was one of those rare scientists, especially rare for chemists, who captured the imagination of a wider audience. He was, as Robert Gower was quoted as saying in the obit in the New York Times, "a rock star in technology. 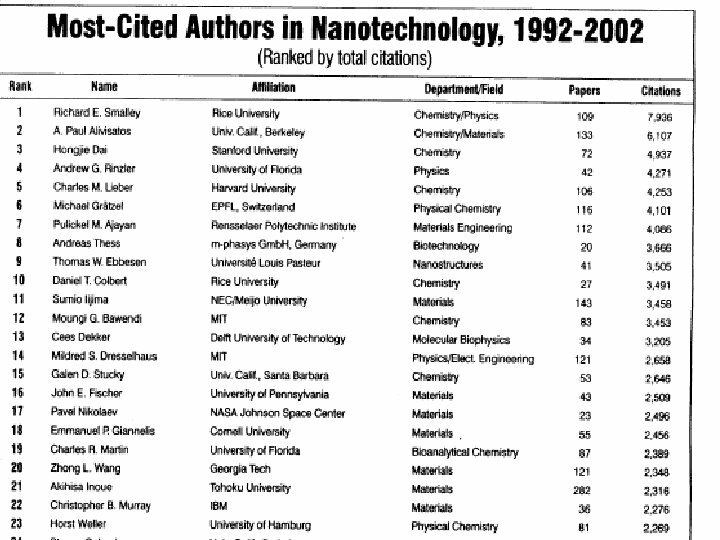 ””(ROTMAN, TECHNOLOGY REVIEWS) • NANOSCIENCE & NANOTECNOLOGY HAVE LOST A CHAMPION !!! Alfred Nobel Performed by Chizhov A. A.